Mrs Gliddon has been extremely busy lately organising this year’s ‘HCC Bake Off’ to raise money for the Devon Air Ambulance Trust. Whilst the theme was ‘Be a Hero’ this was relaxed for our younger students, who were just encouraged to bake a cake for the competition. Zeus House took the decision to raise money for this excellent cause after they very kindly supported our Road Safety Day in June. It’s no coincidence that the HCC bake off took place in the week of the ‘Bake off for take-off’ campaign run by the charity. The results of the students’ hard work were on view and on sale after judging took place on Thursday 22nd September. 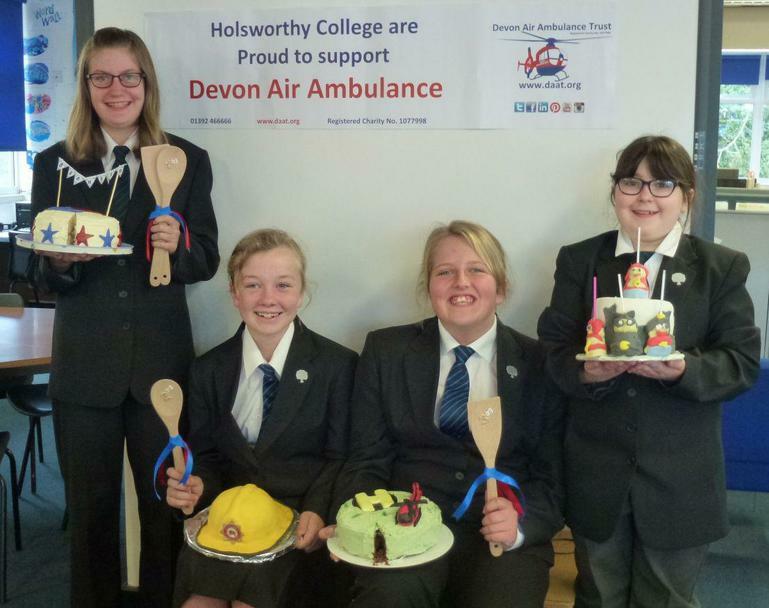 In total 16 students took the challenge to support the Devon Air Ambulance Trust’s ‘Bake off for take-off’’ campaign and got into the kitchen to break out the flour, eggs, icing sugar and piping bags and get baking for a good cause. National Air Ambulance Week is an initiative created by the Air Ambulance Association to celebrate the work of local air ambulances giving them a national voice and an opportunity to promote the work they do at a local level. It takes place from Monday 19 to Sunday 25 September. We were overwhelmed at the standard of the entries and extremely grateful and proud of the students who entered this competition and put in so many hours of hard work – not to mention the costs involved to create these sensational cakes. Our judges – Paul Hollywood (Mr Scott) and Mary Berry (Mrs Kennedy) ably assisted by Head of House, Mrs Cobbledick, deliberated long and hard (and ate lots of cake!) and eventually came up with the winners. We had several staff enter the competition too. Of the staff entries the winner was Mrs Hutchings, 2nd was Ms Iles, 3rd was Mrs Woodhead and 4th Ms Johns. The winning cakes were raffled off and the other cakes were sold to very grateful staff and students. We are yet to know the total raised but we will let you know as soon as possible. Once again, a huge thank you to our wonderful students and staff, Mrs Gliddon, Mr Scott, Mrs Kennedy and Mrs Cobbledick for enabling this fantastic fundraising event to take place.